Shahpur (Shahapur) is 497 km north of Bangalore and well connected by road to Gulbarga, Hyderabad, Bangalore and Bidar. Shahpur is famous for hills. Sleeping Buddha, made of hills is a popular attraction of Shahpur. Shahpur is the home to the famous Chara Basaveshwara temple. Sleeping Buddha Hill is located near Shahapur town Shahapur taluk of Yadgir district in Karnataka state, India. The hill is made up of 4 small hills that gives the impression of Sleeping Buddha when viewed horizontally in Southwest direction. Sleeping Buddha Hill lies between Bheemarayanagudi and Shahapur and Karnataka State highway 16 passes near to the hill. It is one of the main attractions of Shahapur town. Shahapur is famous for Chara Basaveshwara Temple, which is surrounded by hills in all directions. Its annual function called "Jatre" is celebrated every year in April. Thousands of people gather for this special event. They believe that Charabasava will provide health, wealth and prosperity to whole family. The main attraction of this occasion is "bullock festival", thousands of bullocks from different parts of surrounding districts gather here for trade, which used to take place for nearly 10 days. By the side of Charabasava Temple A Large Fort is there. which had seven gates to enter. Within the fort 7 cannons are still present in good condition. As per the historians the construction period of this fort was between 950 AD to 1100 AD. 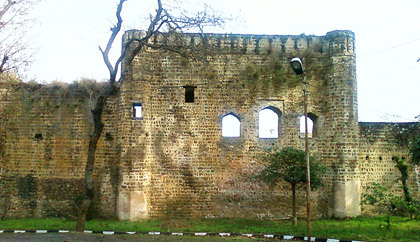 Till the attack of Aurangazebs General Afzal Khan we don't know the pre history of this fort. Mandakini Lake is situated within the fort and the "Lotus Lake" or the "Tavare keri" Beside the Fort surrounded by hills. The Bhoruka power company in the private sector to successfully commission a hydro power station in shahapur. The houses of village "Bendegumbali" are considered to be the most well-constructed houses without the usage of modern tools. Sannati is the Only place in the whole of India where complete unbroken inscription of emperor Ashoka was found.